Welcome to the First Ever! 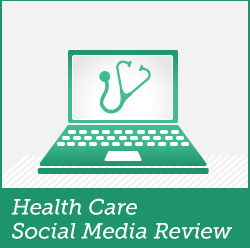 Edition of the HealthCare Social Media Review. First, I would like to thank my extremely helpful colleague, David Harlow, who was instumental in getting our endeavor up and running. David will host the next edition of The Review on his website, HealthBlawg. Second, I would like to thank all those of you who helped out with advice, ideas, and willingness to host future HCSM Review Editions. Third, I would like to thank all those of you who submitted posts for this first edition. I truly enjoy reading all the posts that I receive and I thank you all for the opportunity. I did not specify a topic or theme because I just wanted to see what kind of posts I would receive. I could then categorize the posts the way that I saw fit. So here goes…. A great post on Physician Guidelines for using social media in healthcare was submitted by Mark Ryan from his blog, Social Media Health Care. Mark is a family medicine doctor with great experience in social media. He speaks on the use of social media in healthcare and is on the Mayo Clinic Social Media Advisory Board. This post offers suggestions and advice for physicians about how to use social media and the advantages that can be gained. Indeed, social media is a force to be reckoned with! For an overview on social media options, see Gary Levin’s post on The Many Platforms of Social Media in HealthCare on his website, Health Train Express. Gary is a social media expert and hosts almost daily hangouts on Google+ This post talks about the options available in social media and includes a very cool infographic with stats on what percentage of providers and physicians are using social media and how. Dan Diamond’s post, Hospitals on Twitter: Current Trends and Proven Strategies, offers really great advice on how to use Twitter and also wonderful information on the use of social media in general. Dan is managing editor of the Daily Briefing, the Advisory Board’s flagship newsletter, and also steers the firm’s email and social media strategy. He is an expert in healthcare news. His post goes into detail on how to work with Twitter, how Twitter started, stats on Twitter use and strategies to maximize use of this great social media tool. David Williams, Co-Founder of MedPharma Partners, LLC, talks about Doximity: The Professional Network for Physicians on his website, The HealthBusinessBlog. David interviews Jeff Tangney, Co-Founder and CEO of Doximity about HIPAA compliance, privacy and offering physicians a safe place online to talk and share information. Jeff also talks about some major cases that have been solved on iRounds, Doximity’s mobile platform. He then goes on to talk about the Doximity business model, and the advantages the service offers to physicians. A worthwhile HCSM service indeed! Marie’s post is filled with great information – Read it and learn about Pinterest! David Lee Scher, Founder and Director at DLS Healthcare Consulting,LLC, wrote a great post about improving health literacy through digital health technologies on his website, The Digital Health Corner. Dr. Scher states, “Technology can improve health literacy…patients without PCs at home may watch in the provider’s office, log in at the library or via a smart phone….let’s use common sense, get with the 21st century and improve the patient relationship literacy of our medical students, physicians, and other providers. “So, if they[teens] are doing all this through one main ‘portal’, it makes sense that we, as health professionals, reach them in that space. The advantages of doing this could be huge” And she’s right! Kent goes on to give specific examples of individuals using social media and technology to motivate themselves, change their behavior, and monitor their progress. With increasing technological advances and social media options, more and more individuals and organizations will adopt this behavior. And last, but certainly not least, the Privacy Issue! In his post, David also offers resources and tips for those who want to learn more about privacy and social networking. And in 2 weeks time, David will be hosting the Second Edition of The HealthCare Social Media Review, and so David, I pass the HealthCare Social Media Review hat to you! For details on The HealthCare Social Media Review, including submissions, hosting, hosting schedule, more information, please see our Main Page!